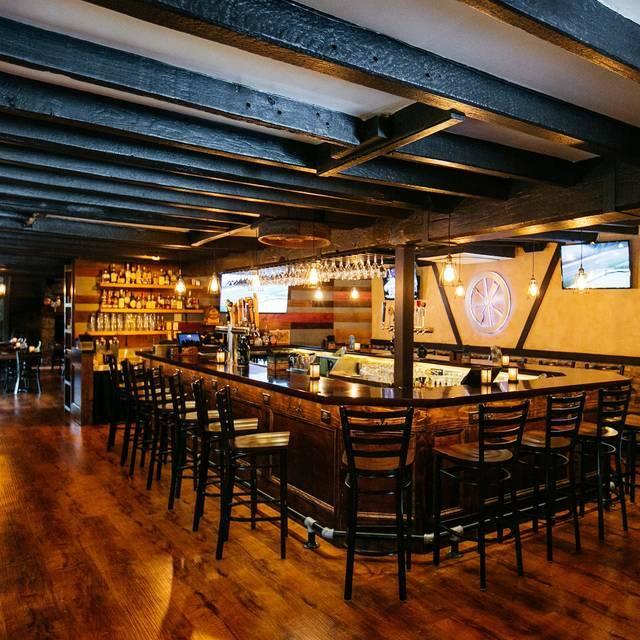 Water Wheel Tavern is an historic Bucks County landmark originally built in 1714 by John Dyer, an English Quaker. It existed for centuries as a water wheel driven grist mill, and later hosted both a post office and a general store. The mill was transformed into an inn and tavern with the repeal of prohibition in 1933. 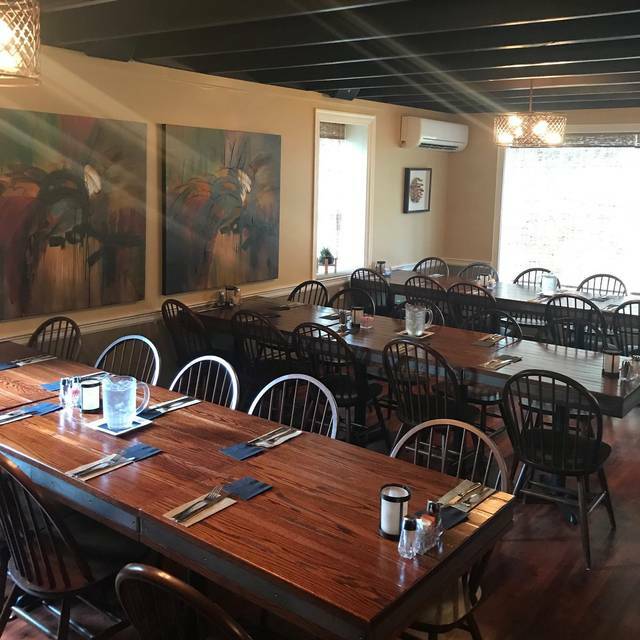 Now, after an extensive industrial chic renovation, we invite you to experience our comfortable ambiance, diverse menu and hard working professional staff! Easter Brunch reservations available by phone only by calling 215-348-8300. Seatings available at 10:00 AM, 11:30 AM, and 1:00 PM. Went for the Prime Rib special on Thursday night. Great piece of meat however sides (mashed potatoes & green beans) were under seasoned and boring. Would have been nice to have a salad included. Just a bit more effort would have made this meal excellent. Service was spot on. This is a gem of a place. Wish we lived a bit closer to it. Had a great night of food, drink and song. Loved the beautiful bar area with its exposed beams and wood finish. Wait staff and others were very attentive to us all night. Food was awesome! The best cheesesteak eggrolls, with a fondue that is out of this world. Braised pork flatbread was tremendous, and the cheese plate was huge. Dan Ward played every request that was made, and kept the atmosphere alive. Definitely highly reccommended! Great restaurant, food and atmosphere. Good food and huge portions. The fish and chips easily serves two. The garlic hummus was quite good, served with veggies and warm pita. A real bargain during happy hour. The duck confit was ok but was breaded for some reason.... Brussels sprouts and fingerling potatoes with it were both quite good. My husband wanted to try the place since he met the owner through work. We went for our Anniversary and it did not disappoint. I’m doing the Ketogenic diet and they had plenty of options for me. Ended up having a steak and Brussel sprouts and it was amazing! Will definitely be going back. 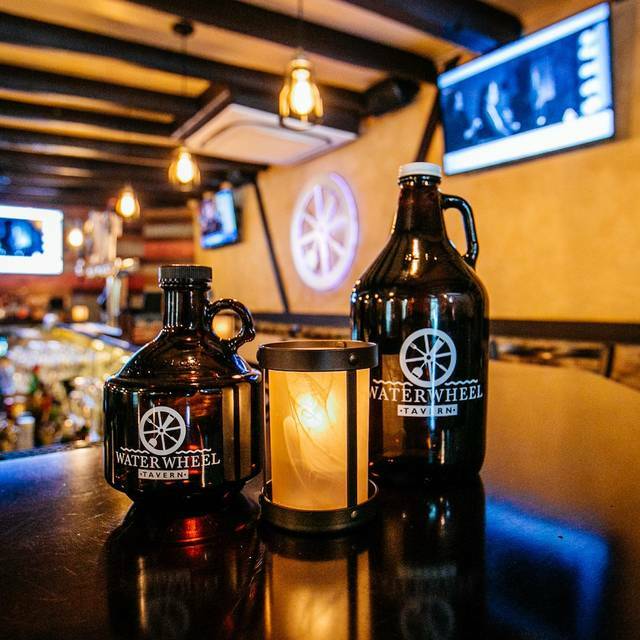 If you are looking for a rustic tavern atmosphere with great food and live entertainment on a Friday night, the water wheel tavern is for you. Both the food and service are excellent. The restaurant atmosphere is awesome, so much to offer, so many rooms and experiences. Very pleased with unusual menu, lots of new items to try. Your server and manager are awesome. We will be back soon. 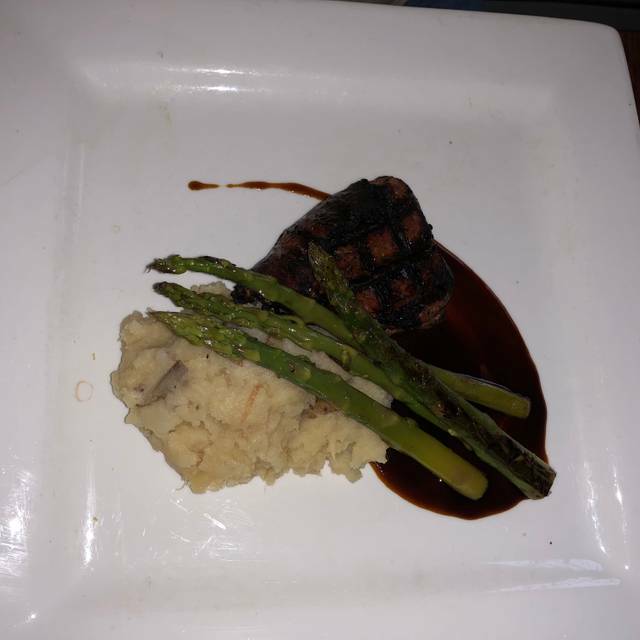 I had Filet Mignon, my husband had the rib-eye. Both were cooked exactly as ordered (medium rare) and were melt-in-your-mouth delicious. We both had dietary restrictions (low carbs) and the server was happy to accommodate our request to substitute the accompanying potatoes with green veg. Every time we come here we have a friendly, competent, attentive server. And all for a good value. As far as noise level, if you sit in the bar area when there is a trio, it can be loud. BUT there is plenty of seating away from the band area, so it's never an issue. The building is very nice and authentic. Reservation are needed on Saturday. A nice big parking lot. Ordered the crab cake sandwich with the sweet mashed potatoes. The potato’s had so much either white or black pepper I couldn’t take more than 2 bites as there was so much pepper in them it spoiled my appetite for the rest of my meal. The waitress mentioned it to the manager and offered us a dessert in return which was nice but my meal and stomach was already upset from my meal. I didn’t eat the dessert either .. my husband enjoyed it tho.we are frequent patrons and once in a while have an issue with dinners there. Just thought I would share our experience. Love the Impossible Burger.......still hard to find. Went to Sunday brunch,bacon very undercooked,food not repleanished in a timely fashion,salmon over cooked, no sauces or accompaniments for carving station, overall,not very pleased ! The Waterwheel was built 300 years ago and when you walk past the upstairs bar and see one of the dining areas with it large fireplace you are taken back to the inn's earlier times. The food is usually very good, I've eaten here more than a dozen times in the last few years. The service is always friendly, there is a bar with live music certain nights but they have seating in the lower level if that's not your thing. The prices are reasonable for what you're getting, I would recommend a reservation on the weekends as they are pretty busy. My table of 6 were very happy with their meals. I had the grilled cheese and it was both outstanding and unique. My side order of onion rings were perfect with some kind of tasty crumb type coating. We will return again and again. Was excited to check out the water wheel under new ownership. We’ve always loved going in the past and we’re very happy to see it has maintained the same vibe and charge with a little updating and improvements! Can’t wait to go back. Very nice evening. Our server was gracious and attentive. I made a mistake with what I ordered and they kindly accommodated replacing it with something else. We were downstairs and there was a Birthday party going on so it was noisy but fine. We would go back for sure. They had a guy playing the guitar upstairs and people hanging at the bar- nice atmosphere. Not enough food to choose.Also very dark could not tell what was in the buffet warmers . When I went over to get the sliced meat the employee was standing by the omelette area and didnt even look my way ! I walked away . Lighting over the buffet tables and food was very dim. Additional lighting is needed. Nonetheless, the food was delicious. Unfortunately it took nearly 25min to be approached by a server. Service was good after that but there was difficulty redeeming an online code - which took nearly 20minutes - and at this point the restaurant was nearly empty. Food was only average, very disappointing given my other experiences here. 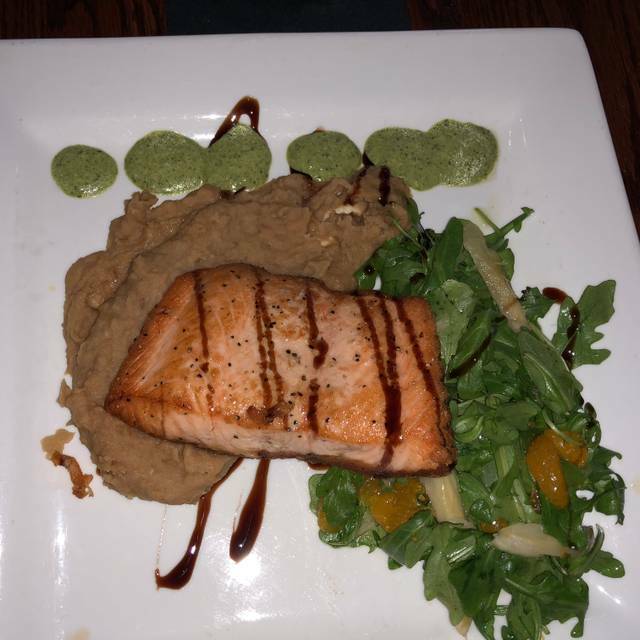 Water Wheel service and food quality has improved a lot since we first tried it after it’s opening. The French onion soup had excellent vegetarian, rich broth. Cod fish n chips fresh, flaky and tender. Crab cakes without filler was just right with wild rice risotto and haricot vert. First bourbon a little shy, but second was better after a mention. Overall a treat. The restaurant was great except for the lighting. The place where we were seated was very dim/dark that we had to use our cellphone flashlights to be able to read the menu. The food was really good. We were there on a Saturday night and they had some live music that was outstanding. The noise level during the busy hours is as most places, a little noisy but the service was great and we will go back again. Great ambiance as a old Colonial era mill and tavern. On a country road but easy to get to from nearby highways. Large area three levels but cozy with low, beamed ceilings. Saturday night entertainer in one of two bars for music. Wide range of appetizers and entrees. Our table had the salmon, mussels, fish and chips, ahi tuna. Wings were meaty and tasted great. All served hot and cooked properly, priced reasonably. Server was very attentive. Relaxed pace, no rush on courses. Will be returning. 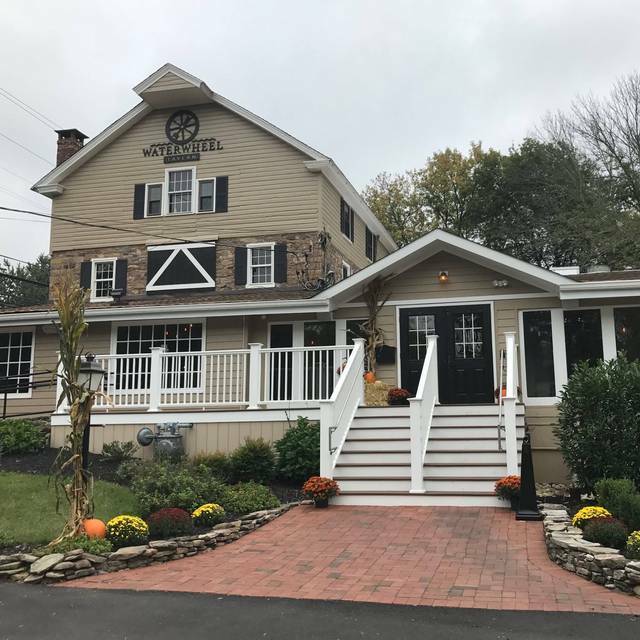 In an area with lots of good restaurants and fun taverns, the Waterwheel is a favorite, particularly for their dry rub wings, fries, and fun atmosphere in a very Bucks County setting. The staff are wonderful and personable and the service has been great whether we've gone on a busy weekend night or less busy early evening. The feeling of the place and the noise level depend on the room where you're seated - out in the bar, there is live music and high tops, and a livelier feel - back in the dining rooms there is atmospheric quiet from the solid stone walls, but nothing staid or stuffy. Multi-age crowd every time I've gone - my son, home from law school with friends, feels just as at home there as I do dining as an older couple. In the summer there's a large outdoor dining area that gets very busy on weekend nights. Full interesting menu. We had a wonderful time at the water wheel. We had a great waiter, great food, and great conversation! As a matter fact, our next girls night out will be at the water wheel once again. We had a great time, And expect that to happen again. For my Son’s Golden Birthday. Our waitress was fun, precious and professional. The manager was very aware and effective. Pleasantly surprised at the brunch. Great omelets, lox, shrimp, and coffee. Food was okay, at best. My grilled chicken was really dry and flavorless plus the vegetarian burger was simply awful. There are so many vegetarian options out there perhaps you should try different ones! Been here twice, loved both times. Food was good. Friendly server. Our new favorite place. 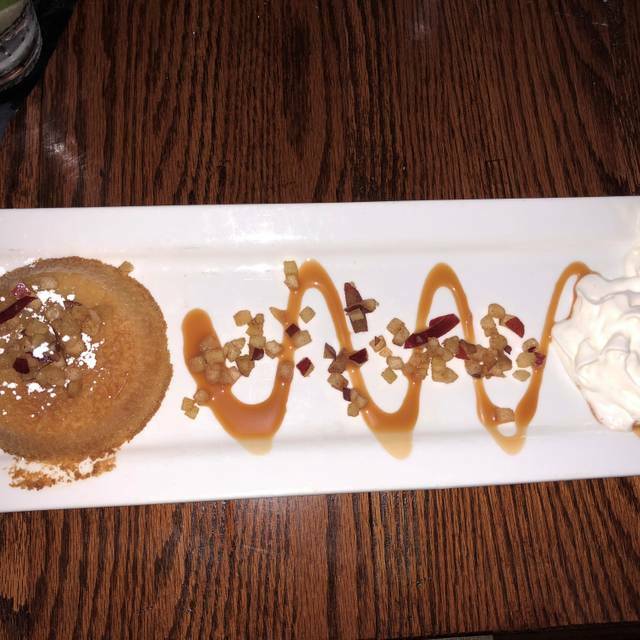 Great food and excellent seevice! My wife and I had a very relaxing and tasty lunch. We were there on New Year's Eve. It was lively but there weren't people waiting meaning they weren't in the weeds. Our dinners came out while we were still eating our salad. Same thing happened to the table next to us. Nothing is worse than being rushed through a meal. I was a waitress through school and I wouldn't even bring them to the table in that situation. We were there and home within one hour! That is not my idea of going out to dinner. And then we waited a bit for the check. The food and ambiance are great but bad service kills a dinner out. Food was ok, but waiter was not friendly at all. All the tables around us had the same complaint. Specials for New Years Eve were awesome, great food, good wine. Only issue is Beer on Tap Selection is poor. Not enough craft beer, used to be a great spot for Beer variations, Buffalo Wild Wings has a better selection. Loved this place! Went here for New Years Eve. The pesto pasta was delicious and my boyfriend got a lemon chicken that was to die for. Will definitley be coming back! We arrived a little before reservation for NYE dinner and had drink at bar. Bartenders were amazing. Very nice and attentive, Taylor and Donna. We decided to go get out table and have dinner. We were seated and ended up sitting there for 30 minutes. Nobody came to offer water or drinks. Nobody came period. We got up and went back to bar as we wanted to try out the food. First time here. Thanks to Taylor and Donna for taking good care of us. If not for them we’d have left and written a nasty review. Dinner was great. Food was excellent. Would go back but only to eat at the bar. Came here due to proximity to an event we were attending. Pleasantly surprised. Very crowded on a Saturday evening ... sort of on the loud side. Food and drinks were fantastic. Service was excellent. I look forward to eating here again and highly recommend it. Great location. Good food..excellent service.